The verdict? Corn Patch Corn Casserole wouldn’t be here on my site if it didn’t pass the test. This Corn Patch Corn Casserole is as tasty as I remembered it from all those years ago, with all that corn flavor and just a bit of a Mexican flair from the cornmeal and canned green chiles. First of all, Corn Patch Corn Casserole isn’t anything fancy or sophisticated, it’s just a good ol’ downhome kind of side casserole that’s perfect to bring to a barbecue or a cookout, maybe a potluck, but also perfect as a side at home with Mexican or Southwestern food, too. 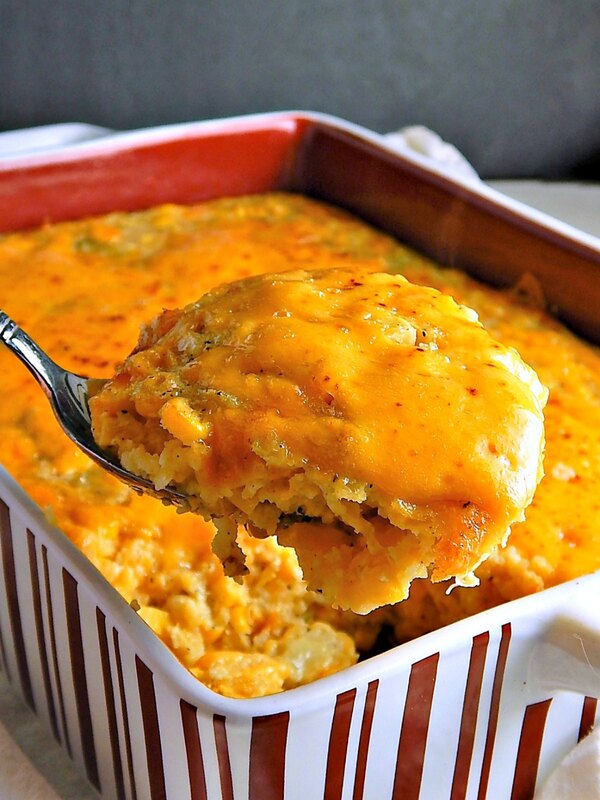 This is kind of like a corn pudding, except it’s cheesy and leans just a bit towards the Southwestern with the can (I usually put in two cans) of green chiles. Some people call this a tamale casserole, and I suppose I could see it if Masa Harina is used instead of cornmeal. If I were making a tamale casserole, though, it would have to have a lot more of the tamale components, not just a bit of cornmeal. As it is, I’ll just stick to the original name, Corn Patch Corn Casserole, as it was given to me way back in the early ’80’s at one of our “Food Days” as we called them in our office. We always had the best Food Days, and since I lived in the Denver area, there were bound to be a lot of dishes with a little Southwestern Flair. This was one of the more popular ones. Think about doubling it if you’re bringing it anywhere with a crowd. There is absolutely nothing to making this casserole. It’s a dump and mix concoction and you can have it made and the mess cleaned up in literally minutes. Now that being said, it contains canned ingredients. Canned corn, canned creamed corn, and canned green chiles. If you’re morally opposed to eating such things. and I get it, especally with the creamed corn, you can go the fresh route. For both the corn and the cream corn, if using corn on the cob, you’ll want to cook it, but lightly, so it’s still a little firm and not overcooked. Since a can of corn is about a cup and a half of kernels, and a cob of corn is about 1 cup, you’ll need about a cob and a half of corn, or a cup and a half of frozen corn to replace the canned. The creamed corn is a bit trickier. You’ll want about two cups of corn kernels (about 2 cobs of corn) and about a third of a cup of cream (preferably) or milk (in a pinch.) Add the two to a food processor and process for several pulses until the corn is broken down to bits. This process can be done in a blender, but it’s going to be a bit trickier. You’ll have to stop and stir it up every pulse. One of those little cans of chiles can be substituted by a roasted, peeled and diced poblano chile. While you might think using the fresh ingredients would make a big difference in the flavor of the Corn Patch Corn Casserole, really, it’s hardly noticeable. I’ve done it both ways, and it was a bit surprising. I guess it’s mostly because of all the frozen or canned products, corn really is one of the best, especially if it’s used in something. Of course, it wouldn’t stand up to a side by side comparison of fresh corn on the cob compared to the frozen or the canned kernels, but for this recipe, it’s your call. As far as the corn, comparing fresh sweet corn to frozen to canned is a lot trickier than it sounds. The canned and frozen corn is generally less expensive in the fall and there will be sales sporadically. When combined with coupons (watch your coupon matching sites) the sales prices can be phenomenal. Fresh Sweet Corn, though, on sale in the summer, generally beats the price of canned or frozen, even on sale. During the summer you might, if you’re lucky, find it four ears for a dollar and a good sales price is three ears for a dollar. So you can see if the sale price of fresh Sweet Corn is 25 cents an ear, that means the equivalent amount to a can (which holds a cup and a half of kernels) would cost about 38 cents. At 33 cents an ear, the equivalent to a can would be 49 cents. The frozen packages vary so much in size, you’ll just have to figure out each brand and size. But if it’s more than 25 to 33 cents a cup, fresh is less. While cornmeal never goes on sale in my area, cheese and eggs do. But first of all, check out Aldi for great prices on both cheese and eggs. If you’re shopping at your regular grocery, it does pay to really watch for sales prices on the cheese. Check your coupon matching sites, too, and they’ll alert you to the best deals with coupons you can download or print. Grocery store cheese is one of those items that generate Catalinas – generally unadvertised. If you’re not familiar with Catalinas, they’re like a coupon that prints at the register giving you so much “money” back to spend on your next visit. Usually, they require a purchase of a certain amount of items to generate. Cheese can be frozen though it gets a bit crumbly. It’s fine in casseroles, though. Eggs are usually on sale during pre-holiday sales. They keep for weeks so stock up at a low. Mix together all ingredients except about 1/3 cup of the Cheddar cheese. Pour into a sprayed or greased casserole, 10 x 7″ or equivalent. Bake for about 35 to 40 minutes, or until a knife inserted in the center comes out with no crumb attached; there may be some moisture. Top with cheese and bake for an additional five minutes or until cheese is melted. I’ll be sharing Corn Patch Corn Casserole at Fiesta Friday 236, hosted this week by Julianna @ Foodie on Board and Debanita @ Canvassed Recipes. Stop by and take a peek at their sites. You’ll love Julianna’s food – everything she makes has a special touch that takes it over the top. I’ve only just began exploring Debanita’s blog, but the scope of her recipes is outstanding! You never know what you’ll find. This entry was posted in Click here for Fabulous Food Posts and tagged Corn, cornmeal, creamed corn, hearty sides, Hot Peppers, Poblano Peppers, Side. Bookmark the permalink. Hey Mollie. I’m planning to use this recipe for Thanksgiving and wanted to ask if I could substitute regular flour for the cornmeal, since I don’t like the texture. What do you think? Hi Vanessa, flour can leave behind that raw taste if it isn’t cooked through in a roux sometimes. I’d be worried about that. Maybe you could try the Masa Harina, but because it’s so fine, I’d use a little less of it, like 1/2 cup? A good alternative. Thank you! We don’t have tri tip out here! I suppose the closest would be a small sirloin roast. I don’t know why the stores don’t get that we’ve been hearing about tritip for ages and want to try it!! Hi Mollie– it’s not the greatest cut of meat (have to cut against the grain) but lots of flavor. Love this corn recipe– I’ll let you know when I make it! As a belgian, I am all new to using corn in different ways & this is a good one to start with! So creamy yet lovely! Thanks, Sophie. It’s nice and easy and so delish!! Plus the corn and cornmeal drives that flavor home. I have fresh corn in my allotment garden so i can use that! omg – that would be so good!! Our family loves corn casserole, but ours dosen’t include the chiles or cheese. I can’t wait to make this as I already know it’s going to be a hit! I haven’t had corn casserole for years. It used to appear on our table often when I was a youngster. Now all I can think of is the corn casserole. Got to make it soon. Thanks much for hosting for us! And, yes it IS pure comfort food. I might have to jazz it up a bit more next time I make it. A few jalapenos, maybe! Thanks much Petra – it’s actually not quite as cheesy as it looks, but definate comfort! Thanks! I’m glad I came across it and revived it! This looks so yummy and I LOVE that baking dish! Thanks! I love it, too. It’s new and I’ve been just waiting to make something in it! 🙂 When I decided to make my corn patch I was all exited to use it. I’m such a little kid, sometimes, lol!